Email marketing is one of the most effective marketing strategies for online businesses and SEO marketers. There are lots of strategies now in order to generate leads but email campaigns still remain on top, that’s why many marketers take time to build a good email list before sending out their email campaigns. However, that’s not enough, you have to use email verification software to determine if your list is acceptable and have valid addresses. Email marketing offers a higher conversion rate as compared to other media campaigns and you can also easily advertise, promote and monetize your products at the same time. If you aren’t selling products, email campaigns can still be useful for you. For instance, you have a new blog post or review article, you can send a notification to your email list so that they will see it immediately. It will help increase valuable traffic to your website. Whenever you will be launching a new product, campaign or feature on your website, you will be able to instantly engage with your audience in a more personalized and detailed manner as compared to social media. Tweets are too short and Facebook can sometimes be unreliable when it comes to ensuring your posts can be seen by everyone following you. Every email that you send to your recipients is a great opportunity for you to relate to your audience and to show them that you offer relevant service and show search engines that your website is trusted. One way to improve your email marketing campaigns is to make sure that your email list is clean and that all emails have been checked. That’s why you need an email verification software to help remove those invalid emails from your list. Email validation is important if you want to be successful in online business. Other than social media, emails remain the top means for marketers to communicate with their users. If you don’t validate your emails then it can affect your online reputation and send your business down the drain in no time. Most email verification software is readily available online. Many people check their emails upon waking up, make sure that yours land in their inbox and not the others or spam folder or else how can you effectively market your business? You can save yourself the worry and also your money by validating emails since it can help enhance your reputation, lets you reach out to your users and every click is repeated traffic to your site. Online businesses store a lot of user data and email verification is important not only to know if the email is can be used for your email campaigns but also make sure that you are sending emails to the right person. Keep your database clean no matter what email service you are using. Once you have a clean and useful list, you can start your email campaigns. Real time email verification will ensure that all the information is relevant. It can be very costly and a waste of time if you manually check information entered in your list. This takes up a lot of time and resources especially when you need to do a lot of things. 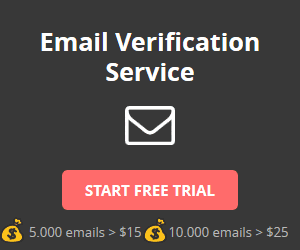 Use an email verification software and you can easily clean up your list in just a short span of time. Make sure that all the emails that you send are delivered to the right users. Sometimes emails can be missent due to typographical errors entered during sign-up. Verifying emails can help lessen that occurrence and lower bounce back rates. Bounce back rates are similar to letters that are returned to you since there is no one accepting them due to a misspelled or invalid address.